A scene from “Manifest Destinitis” at the San Diego Rep. According to San Diego Rep playwright-in-residence, Herbert Siguenza, who coined the term for his latest creation, “Manifest Destinitis” is a morbid terror of the American philosophy of Manifest Destiny, a belief in America’s God-given right to expand their territory from coast to coast and, says one character, “demonstrate American exceptionalism.” In other words, colonialism. Or, the loss of land, home, culture, personal effects and God-know-what-else. In this riff on Molière’s “The Imaginary Invalid,” Siguenza creates the Spanish landowner, Don Aragon (Molière’s original was Argan) who is diagnosed with the dread disease, which is destined to kill him in a matter of days, says his money-grubbing quack doctor. But then, Aragon is reminded that it was Spaniards who invented colonialism. So it goes throughout the English-Spanish adaptation of a 16th century French farce: attack and counter-attack, barb and retort, serious point countered by banana peel comedy, with more than a little current political commentary thrown in (one of Aragon’s nightmares inspires “a sense of deep fear, of a person with orange hair ruling the country”). And of course, there’s plenty of good old-fashioned slapstick. Siguenza, a gifted comic and clown who plays two roles — male and female — gets to do some nifty pratfalls, along with his wink/nudge, fourth-wall-breaking self-congratulatory humor. Clearly, the playwright has the election in mind, but also, like Molière, the pathetic state of healthcare, including outrageous costs and “pompous, gibberish-talking” doctors; not to mention gold-digging wives, the foibles and failings of the Catholic Church; and the rocky course of true love, flying in the face of arranged marriages and blatant mismatches. Everyone involved in this delightfully raucous, laugh-filled San Diego Rep world premiere is obviously having a field day, with wacky over-the-top antics gleefully encouraged by director Sam Woodhouse. And we, the audience, often included in the merry-making, have an equally good time. 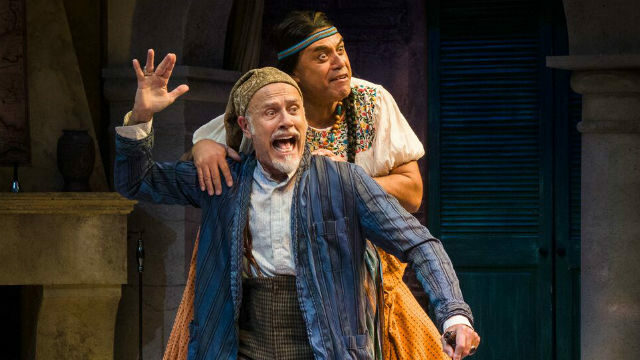 Mark Pinter may not have the best Spanish accent on the stage (almost all the rest of the cast is Latino), but he’s broadly comical as the eternally clueless, gullible Aragon. The Don only wakes up to reality when he’s convinced (by Siguenza’s big-butted servant, Tonia) to feign death; then he finally perceives the disdain of his beloved wife (a witchy, black-clad, fandango-dancing Roxane Corrasco) and the true devotion of his daughter Angelica (one of two Aragon offspring, both deliciously played by Jennifer Paredes, who shows more talent and range with her every role). Angelica falls in love with a well-endowed gringo surfer dude — a, like, totes gnarlsome, rad, So-Cal-speaking dullard (perfectly portrayed by Jacob Caltrider). But her father wants a more financially (and medically) advantageous match for Angelica, so he arranges a marriage to the doctor-son of a neighboring landowner (John Padilla, solid here, but really amusing as Aragon’s wife’s lover). Salomon Maya humorously plays three roles, but it’s as the supremely geeky, socially inept, grimacing nerd doctor-son that he brings down the house. The faces he makes, and his awkward moves and weirdo eyes, are priceless. Richard Trujillo acquits himself well in several roles, most memorably as the Don’s brother, the bat-wielding Friar Beto. Young Scotty Atienza is excellent as the newsboy who announces the latest local developments, that everyone ignores: “The Mexican War is over! We lost the war!” and “Gold discovered at Sutter’s Fort!” (the latter proves to be an important plot point). One of the funniest running bits is the involuntary verbal outbursts of Don Aragon that foretell the Yanquí takeover: words like bland food, mayonnaise, Birkenstocks, Juicy Fruit, pilates, Starbucks and The Clintons spew unbidden from his mouth. The magnificent hacienda set (Sean Fanning) features adobe and brickwork, stone flooring and wood beams, and an archway that reveals lush, colorful California agriculture out back. Jennifer Brawn Gittings’ costumes are delectable, and the lighting (Lonnie Alcaraz) and sound (by composer Bruno Louchooarn) contribute mightily to the whole. So, history and politics mix with heavy doses of satire and silliness to give us a taste of Alta and Baja Cali in the old days (though they did seem to have Shakespeare productions at the “Viejo Globo,” i.e., Old Globe). A lot of the new play hews closely to Molière’s characters and plotline. But Siguenza, a co-founder of the Chicano comedy troupe, Culture Clash, is a Californio who gets in a ton of topical jabs, to the audience’s delight. If just one of his serious/jokey comments gets through and makes you have second thoughts (which it should), his effort qualifies as an unequivocal success.